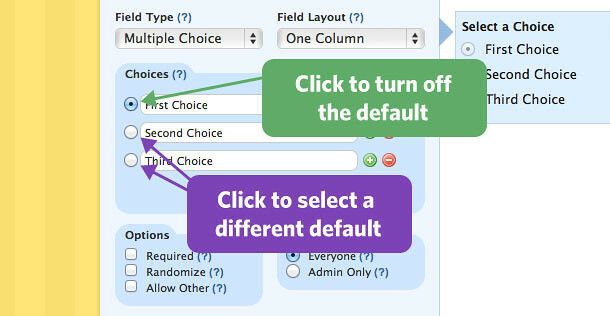 Make your forms easier to use by customizing your multiple choice fields. When you add a multiple choice field to a form, by default, the first choice is selected. You may or may not want that for your field on your form. You can select a different default option by clicking the radio button next to a different choice, or turn off the default choice entirely by clicking the active radio button. Note that without a default choice, no answer is still a valid choice by the user unless you specifically mark the field as required. Also note turning on and off defaults works the same way with checkbox fields. Thanks to Eric Hansen for the idea on this quick tip!